Lock in a great price for Hotel Galini – rated 9.2 by recent guests! We stayed in the Palm Villa, amazing place, incredible location and view, extremely nice staff. The location was quiet with a view of the sea that was fabulous. The sunset view from the patio was better than expected, because we could have appetizers and wine while watching the sunset. The cleanliness of the room was very good. The breakfast on terrace was extremely good and large portions to keep us full until mid-afternoon. Two mini stores nearby were very convenient and so was the bus stop. The hotel staff especially Ionna was very knowledgeable about good restaurants nearby, directions to places, and always friendly. Absolutely an INCREDIBLE place to stay. Fabulous location and the staff (Christina & Ioanna) are the best ever. From the hospitality to the great customer service, words cannot describe the excellent experience from beginning to end. Highly highly recommend it. I liked the location of the place (firostefani) and it was cute. we loved the galini cafe breakfast. 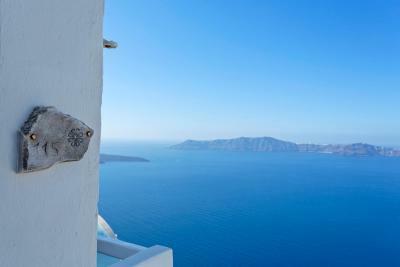 We stayed in Fira 3 years ago and longed to be in the quiet and beauty of Firostefani. We were so fortunate to book the Junior Villa at Galini Hotel. We had a private service pick us up at airport and they spoke with Christina who made sure all of our luggage was delivered down the many steps to our villa. The view was spectacular from the villa and we had a private terrace and hot tub above us where we spent each evening drinking wine and being mesmerized by the Caldera view. We travel frequently and this was my daughters favorite view. Not to mention the most amazing breakfast delivered to our villa everymorning. The greek yogurt and fruit were the best you will ever have. Coffee, eggs, anything your heart desires. I can't say enough about this place from the welcoming snacks and wine and every convenience you could want while traveling. The location was fabulous! Perfect sunsets could be viewed from our balcony with a great glass of wine or two. The staff was friendly, accommodating and a great resource for information. We ate breakfast at the Hotel Galini Cafe every morning and enjoyed the stunning views and wonderful juice. Fresh squeezed orange juice, Greek honey and yogurt with fruit amd the coffee was fabulous. Hotel Galini has a highly rated Galini Cafe which provides breakfasts, lunches and cocktails. The food was fresh, delicious. The hotel was impeccably clean, comfortable and the plumbing great. It does not have spas or pool but is quieter because of this. The staff are very good, Christina is especially helpful and competent. The location is wonderful- convenient, great views of the caldera, the hotel backs onto a lane but it's rooms face the Caldera are are quiet and protected from outdoor traffic. The room was extremely clean and the bathroom was very spacious! Christina at the front desk was beyond helpful. She told us the best ways to get around the island and gave us restaurant recommendations. She also helped us coordinate how to get to and from the airport. The location of the hotel was close to the local bus stop and was walking distance of the center city. Comfortable bedding, clean, great food, perfect location and excellent staff! Everything about Hotel Galini was amazing. My Husband and I stayed in the junior villa and our room was spectacular! The view of the caldera... breathtaking! A delicious breakfast of our choosing was served to our patio every morning. The staff was incredible! We can not wait to go back! Hotel Galini This rating is a reflection of how the property compares to the industry standard when it comes to price, facilities and services available. It's based on a self-evaluation by the property. Use this rating to help choose your stay! 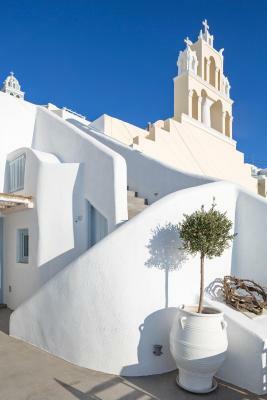 Conveniently located in the village of Firostefani, in Santorini, Galini hotel is hanged at the cliffs overlooking the Aegean Sea and the caldera. Free Wi-Fi is available at the entire hotel, while free parking is also possible nearby. 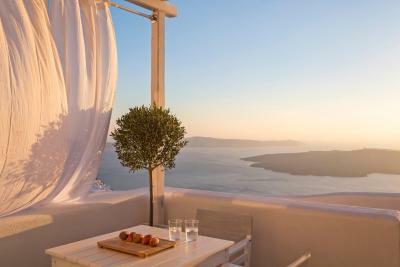 All air-conditioned rooms combine the Cycladic design with modern facilities, like flat-screen, satellite TV and fridge. 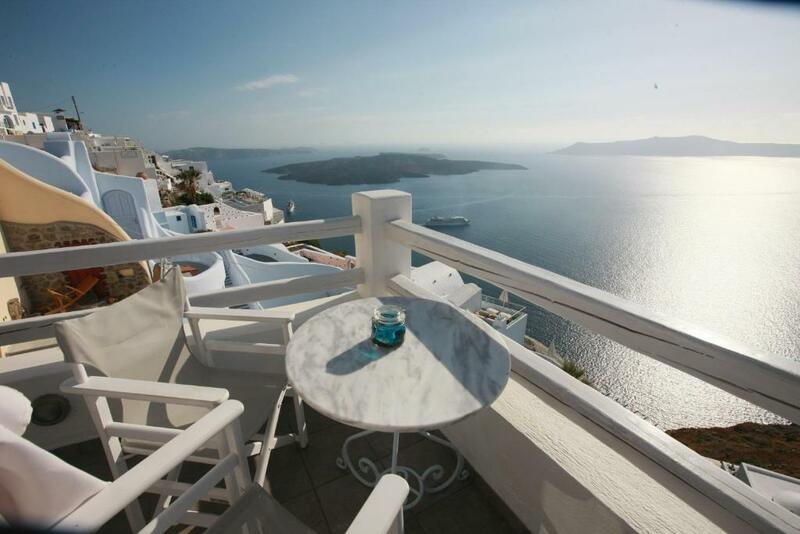 Some feature a private balcony with caldera view. 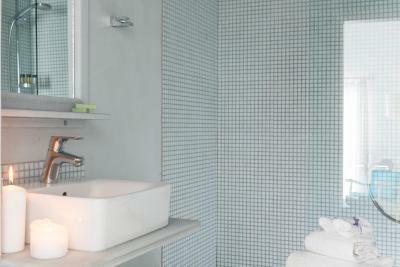 Each unit of Galini has a minimalistic bathroom with a walk-in shower and free toiletries. Complimentary table water and coffee-and-tea making facilities are provided. A breakfast including local and organic products is served with no time limit at the property's terrace overlooking the Caldera, the volcano and the traditional village. You can also enjoy Mediterranean dishes and refreshing cocktails at Galini Café enjoying panoramic views of the Caldera and the Aegean Sea. A welcome drink is offered. The complex is located 5 mi from Athinios Port and 3.1 mi from the Airport. The nearest beach is at 3.1 mi. 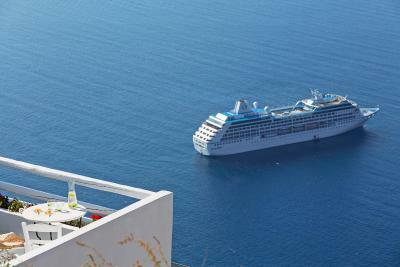 The picturesque village of Oia is around 6.2 mi away. This property also has one of the top-rated locations in Firostefani! Guests are happier about it compared to other properties in the area. When would you like to stay at Hotel Galini? 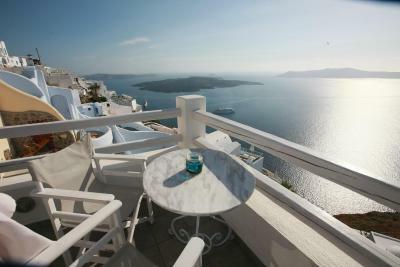 Kindly note that there is no sea view from this room type, but guests have access to a shared balcony with Caldera view. Offering an outdoor hot tub, the traditional, cave-style villa opens to spacious, private terrace overlooking the volcano and the Aegean Sea. It has a separate bedroom with king size bed and Coco-Mat bedding products. 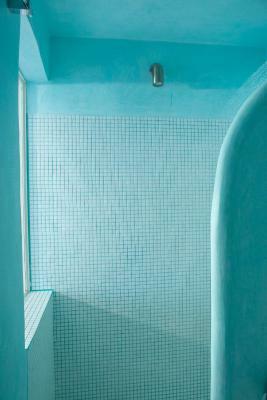 A bathroom with shower and dressing area are also included. It consists of a spacious living room and a fully equipped kitchen. Offering an outdoor hot tub, the traditional, cave-style villa opens to spacious, private terrace overlooking the volcano and the Aegean Sea. It has 2 separate bedrooms with Coco-Mat bedding products, a master bedroom with king size bed and a smaller bedroom with a double or two single beds, each with private bathroom with shower and dressing area. It consists of a spacious living room and a fully equipped kitchen. Offering Caldera and volcano views from its communal terrace, this room includes a satellite flat-screen TV, fridge and a kettle with complimentary coffee and tea. Offering views over the Caldera and the volcano from its private balcony, this room includes Coco-Mat bedding products, a bathroom with a shower, a satellite flat-screen TV and a kettle with complimentary coffee and tea. House Rules Hotel Galini takes special requests – add in the next step! Hotel Galini accepts these cards and reserves the right to temporarily hold an amount prior to arrival. Sensational hotel in a great location. Our only concern was the booking.com website promotes the availability of a pool, where in actual fact the hotel does not have its own pool, but has an agreement to allow guests to use a neighbour hotel pool for a fee a short walk away down a large flight of stairs. Otherwise we had a fantastic stay there. The only thing was that there was no pool or "chill facilities" within the hotel. - the lack of a swimming pool was a big issue in the heat. it would have been nice to have a swim in the property. - a bit too expensive for what the rooms are. Great view ! Great location ! Great breakfast ! The room we stayed at didn’t have sea view, so it was an inner room. The air easily felt a little damp and tight in the room. The services in their cafe is not good but food was nice. Can't think of one thing! Perfect hotel with friendly staff. The breakfast was wonderful and the view exceptional. We enjoyed our stay very much. The location was also perfect. The only downfall was the lack of a pool. Although we enjoyed the beach and did not feel cheated. A pool would be nice addition. The location and view was superb.